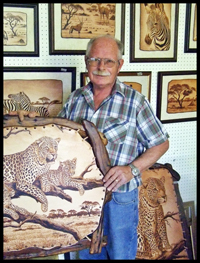 * Please note that all the works I sell are originals, done by hand on real leather. I do not sell prints of my work. I was born on a farm in Niekerkshoop in South Africa on the 11th of September 1951. My father was a bore-man and a hunter and our family of eight lived a nomadic lifestyle for many years, travelling from farm to farm and living in a tent. 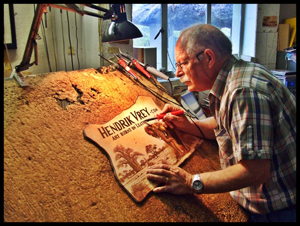 Pyrography ("pyro" means FIRE in ancient Greek) is done by burning pictures or designs onto wood or leather with a hot iron. Since ancient times, people have used this technique to decorate their weapons and tools. In 1967 I rediscovered this technique and began to experiment burning pictures on apple box planks. These days I use electric soldering irons on tanned cow leather. Through over 40 years of dedicated, daily practice I have developed my work to its present form. I do not use any type of colouring or dyes in my work, only darker or lighter shades. Though many have followed my example over the years, I am proud to say that I founded it in my country. My greatest love is African wildlife and landscapes, but I also draw inspiration from a wide spectrum of other topics, such as portraits, character studies, domestic animals, etc. I often make small personalised artworks at exhibitions to demonstrate my work and some of my larger works are up to three meters across. I have also tried my hand at wildlife from other continents with great success. As a true Christian, I believe that Jesus Christ is steering me through life - with all its joys and sorrows. I believe that an artist's work is a reflection of his deepest inner feelings from his heart and soul. I love the fact that I create works of art depicting God's wonderful creation. He inspires me to great heights, success and happiness in what I am doing. Thank you for your interest. I hope you enjoy my art.